The "Town Hall" took place on Jan. 25 in Iowa, in the lead-up to the Iowa caucus on Feb. 1, 2016. 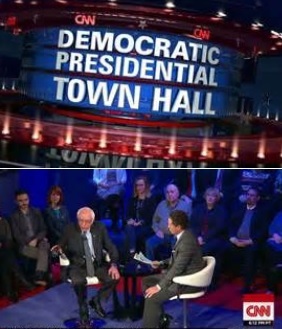 "Town Hall" format meant one-on-one questions to one candidate at a time -- the lack of back-and-forth between candidates made all the questions feel like "softballs." Martin O`Malley: First state in the south to repeal death penalty. Bernie Sanders: Medicare for All: insure 29M people beyond ObamaCare. Bernie Sanders: Single payer: Increased taxes offset by insurance cuts. Bernie Sanders: High school athlete: basketball and long-distance runner. Bernie Sanders: Father immigrated to Brooklyn at 17, penniless & no English. Hillary Clinton: Iranian nukes would have destabilized whole region. The above quotations are from 2016 CNN Town Hall Democratic presidential primary debate.